[Update] Founder's Packs are on Sale! UPDATE (Oct 8): Founder's Packs sales end at 9:00 AM PDT on October 10th, just before MapleStory 2 officially releases. Take advantage of this massive deal while you can and get your head start into MapleStory 2 while you can! As we approach the full release of MapleStory 2, we're opening up sales of Founder's Packs for those that want to get a headstart when MapleStory 2 officially launches. With exclusive items, Premium Club Membership and a large cache of Merets, there's an option for every budget! You also can learn more about the Founder's Packs in its Producer's Blog and get more info in the Founder's Pack FAQ below. Over $40 of content for only $24.99 USD! Grants bonus EXP and Mesos, reduced Trade Fees, allows access to a Remote Bank and unlimited Rotors Walkie-Talkies, Party Bonus to non-PvP Speed and much more! Learn more about it in the Founder's Pack FAQ. A hat based on the classic Mark of the Beta hat from MapleStory's original Beta, and can only be obtained through a Founder's Pack! A special decoration, exclusive to the Founder's Pack, for your character name tag to let everyone know about your early support! An adorable Unicorn land mount with gorgeous pink fur, exclusive to the Founder's Pack! 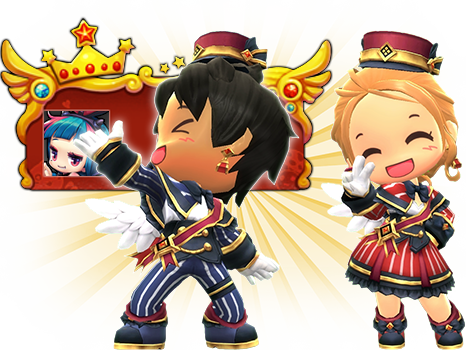 A special currency that can be spent in MapleStory 2 for outfits, hairstyles, house decorations and much, much more! 100 Merets is worth 1,000 NX ($1 USD). Instant Access to Head Start! Buy the Explorer Package Here! Over $100 of content for only $59.99 USD! A snazzy outfit with variants for both male and female characters. Get dressed to the nines before you get in a scrap with this Founder's Pack exclusive outfit! 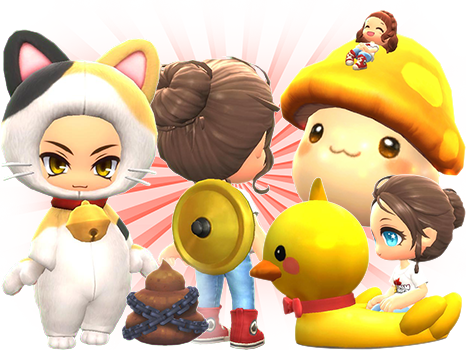 This Founder's Pack exclusive modifies your Chat Bubble with a special flare, to help you stand out from the crowd! Buy the Master Package Here! Over $200 of content for only $99.99 USD! A special, Founder's Pack exclusive emote that gives you a friendly, giant and squishy Orange Mushroom for you to take a rest on! 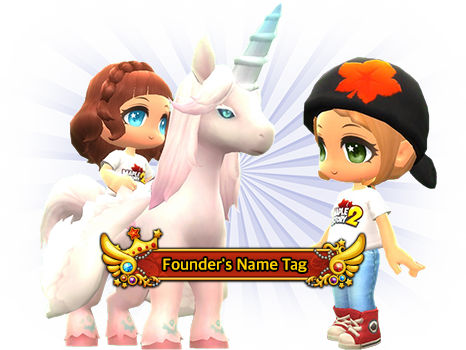 Exclusive to the Founder's Pack, this adds some flair next to your character's name, highlighting your contribution to MapleStory 2! "Soft Serve" Tombstone: This special item replaces the default tombstone when you die with a pile of... brown stuff. Calico Kitty Outfit Package: A special outfit that gives you a delightfully feline appearance! Ducky Boat Swim Tube: Hop into the water on this adorable yellow duckie! Pan Lid: Put a bit of protection on your back with this Founder's Pack exclusive cape! Buy the Legendary Package Here! Q: Can I purchase a Founder's Pack from any region? A: MapleStory 2 is only available in these service regions. If you purchase a Founder's Pack from outside these service regions, you will not be able to download or play MapleStory 2. A: You can choose to upgrade your Founder's Pack at any time before the sale of the Founder's Packs ends. A: Founder's Packs will be available for purchase until MapleStory 2 officially launches. A: Founder's Packs can only be purchased with PayPal, Xsolla, Karma Koin, and a Credit Card. You will not be able to use existing NX to purchase the Founder's Pack. If you wish to use Karma Koin to purchase a Founder's Pack, you must redeem the Karma Koin at the Founder's Pack purchase page, and not redeem it beforehand. A: The Premium Club Membership will be available for 30, 60, or 90 days based on the package purchased. The Founder's Daily Wonder must be activated by December 31st, 2018, and all items within must be claimed by 3:00 PM PST on January 31st, 2019. The rest of the items are permanent in the packages.